Mounting an exhibition about the environment in one of the most built up, densely populated areas of one of the most built up, densely populated cities in the world may seem a provocative decision. But this overdue survey of environmental art featuring 25 artists or collectives, from the big hitters of the Land Art movement to idealists and environmental crusaders is a perfect fit for London’s Barbican centre. Built 27 years ago, and blown in on the same optimistic wind of Sixties idealism that gave birth to Land Art, the Barbican, all mass concrete and architectural ‘brutalism’ provides an oasis of calm amidst the urban sprawl; a contrasting backdrop against which to consider our relationship with nature. Providing the centre-point of the exhibition is the work of Richard Buckminster Fuller, presented as the unlikely grandfather of the Land Art movement. Inside a wooden geodesic dome plays Modelling Universe (1976), a beautifully shot 15-minute interview in which the architect explains his philosophies and life’s work. Sharing his joy and wonder in nature and the universe Fuller explains; ‘I’m not trying to imitate nature, I’m trying to discover and employ the principles she’s using’. Baffled by the human penchant for building with cubes, Fuller examined the tessellated shapes and complex patterns found in nature, and invented a geodesic dome made of triangles; ‘the most stable shape in the universe’. Notable exceptions to the human cube fixation can of course be found among cultures living closest to nature: the yurts of the Central Asian nomads and the tipis of the Native American Indians, or the often rounded dwellings built by utopian communities in the Sixties and Seventies. The latter are the inspiration for I Am So Sorry. Goodbye (2008) created outside in the Barbican courtyard by the British partnership Heather and Ivan Morison. 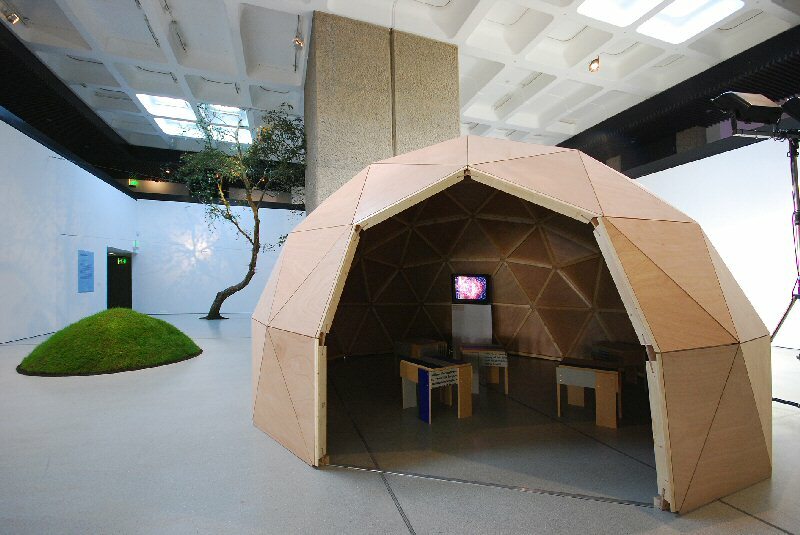 The wooden structure consists of two interconnecting domes constructed from tessellated triangles, roughly clad with split logs and built using the same principles as Fuller’s dome. Inside there are tables and stools fashioned from logs and an invigilator serving hibiscus tea in little white china beakers. Nine of the triangles are left open, offering peepholes on to the lake and plants beyond. Designed as a ‘tea house’ this is the perfect hideaway to sit and chat or read to the sound of nearby rushing water as sunlight reflects off the water and ripples across the inside walls. If some artists in this exhibition explore the serendipity found when humans understand and work with nature, others refer to what happens when we don’t. American artist Mark Dion’s Mobile Wilderness Unit – Wolf (2006) is a comment on our dangerous detachment from nature and the arrogance of believing we can treat it as a commodity. An artist interested in taxonomy and classification, Dion displays a stuffed wolf on a small open trailer; shiny silver, clean and utterly man made. The wolf stands on fake grass, moss and shrubbery – a pathetic recreation of its natural habitat. With no glass case surrounding the work, the viewer can stand millimetres away from the wolf and stare deep into its eyes. The effect is frightening and humbling; a reminder that nature isn’t a part-time leisure pursuit featuring Hunter wellies, tea lights and plastic garden chairs. Similarly Simon Starling’s Island For Weeds (2003) highlights the human capability for foolishness when it comes to nature. Imported into the UK as an ornamental beauty in the late eighteenth century, rhododendrons have become so invasive in Scotland that they are now seen as a weed. Starling presents a floating island, offering ‘space for the rejected plant to grow freely’. The rhododendrons rest in their own personal flowerbed – a metal tray with floats ready to be pushed out into a lake and anchored with chain weights and oil drums. Meter (2009) sees Scottish artist Anya Gallaccio bring an entire tree into the gallery – cut into sections, then reassembled and held in place with wire tethers, screws brutally rammed into the bark. 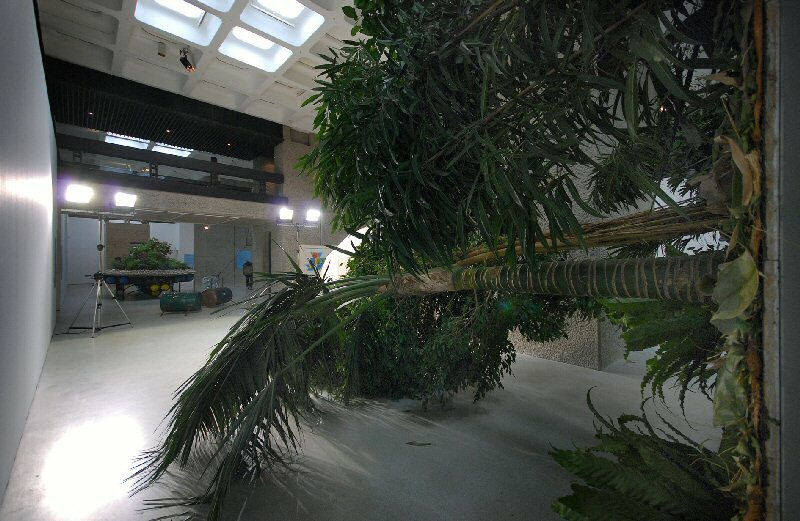 Swedish artist Henrik Hakansson goes one step further and uproots an entire section of tropical rain forest. His Fallen Forest (2006) is tipped over so the trees appear to grow horizontally rather than vertically. Bringing nature into an art gallery in this wholesale manner is certainly striking, but perhaps not the most enduring demonstration of the human appetite for environmental destruction. Expressing this with far more power is LA based collective The Center For Land Use Interpretation (CLUI), founded in 1994. The group exist to research and disseminate information about land through databases, lectures, bus tours, photographs and publications. Shown as part of Radical Nature, is The Trans Alaska Pipeline (2008) – 38 minutes of beautiful still images and brief text accompanied by an undulating cacophony of piano and strings. The group travelled the length of the 800-mile oil pipe taking photos from start to finish. Much like films such as Our Daily Bread, which shows various food processes from ground to plate, this documents a process key to human existence that most of us can only ever imagine. The pipeline attracted much controversy when it was built in the early Seventies from environmental campaigners and native Alaskans, concerned both about wildlife and land rights. The film reveals that the public are not allowed access to the sea because of the oil drilling, while graffiti on the pipeline reads ‘You went too far north’. Although the text contains only bare facts about the pipeline, such as how many people work there and what shifts they do, the film grips and mesmerises with what seems like secret information, forcing us to question whether this is what’s best for the Alaskan wilderness. The exhibition also contains examples of artists who play with nature, where the environmental agenda is often more understated. 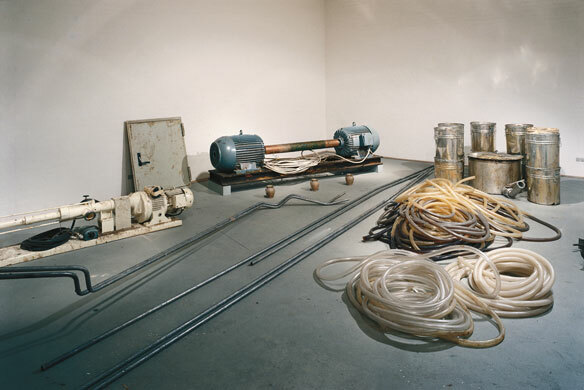 Interventions and interactions include remnants of the Joseph Beuys piece Honeypump In The Workplace (1977), in which he pumped honey through plastic tubes using a motor lubricated by margarine. The transformative, energy giving properties of these materials attracted Beuys in much the same way that the texture and temporality of rocks attracted perhaps one of the most revered Land Art practitioners; Robert Smithson. Film documentation of his Spiral Jetty (1970), the huge 15 foot wide now salt encrusted rock coil he created in the Great Salt Lake, Utah, is shown here alongside Yucatan Mirror Displacement (1969) – fragments of mirror photographed against the diverse colours and textures found in the forest of Yucatan, Mexico. Also included is the early, less political work of the seminal German artist Hans Haacke; evolving pieces using liquids, seeds and animals. His mound of turf, Grass Grows (1969), is recreated here alongside photo documentation of work such as Ten Turtles Set Free (1970), in which he released endangered pet shop turtles back into the wild, Chickens Hatching (1969) and his Rhine Water Purification Plant (1972), which transformed the polluted water of the Rhine into water clean enough for goldfish to swim in. Danish artist Tue Greenfort is perhaps the most playful practitioner exhibited here and the only one to investigate what happens when the tables turn and nature becomes dependant on the urban environment. His set of animal ‘self-portraits’, DaimlerstraBe 38 (2001), in which a frankfurter is planted as bait to lure a fox into detonating a hidden camera are a humorous delight. Adding a political dimension to artistic interventions in nature are R&Sie (n), Paris based architects who take their cue from artists like Haacke and Smithson to create structures that grow and evolve. Symbiosishood (2009) is a proposal to cover a former minefield on the border of North and South Korea with an invasive plant, so that the site of such destruction becomes invisible and boundaries are blurred. Shown here are drawings, a three dimensional digital animation and a scale model of the site. Human obsession with land owning and the prohibitive nature of planning permission is something that has increasingly concerned utopian groups and artists since the Sixties, with many who try to live at one with nature, such as the residents of Wales’s Teepee Valley and Tinker’s Bottom in Somerset being obstructed by the very governments who urge us to consume less and be more ecological. 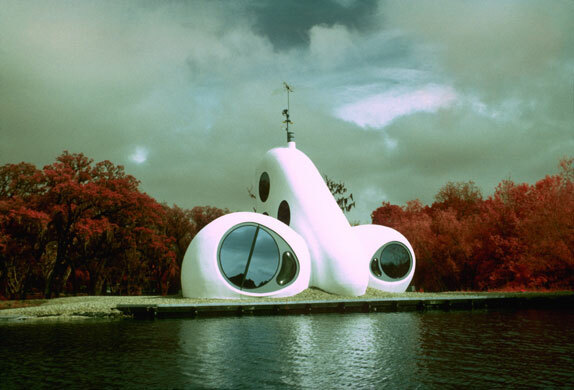 The Ant Farm collective, active in San Francisco between 1968 and 1978 and most famous for their line of Cadillacs half buried in the desert, imagined alternative extra-territorial structures, such as their floating Dolphin Embassy (1974-8). The artists promoted their idea of interspecies communication to both humans and dolphins. Documentation, including drawings of the structure, promotional booklets, clothing, pin badges and business cards are all on display, alongside photographs of their efforts. In one Jim Nollman and Nancy Caldewood float on a raft in the sea of Cortez, Mexico, 1977, playing instruments to the dolphins. In another Doug Michels explains the idea with the use of a sketchpad to a dolphin in a tank. If their ultimate aim for humans and dolphins to communicate through ‘psychic methods’ seems faintly laughable and rooted in the outdated hippy ideals of their era, thirty years on their basic notion of human harmony with nature is undeniably mainstream. Argentinean Tomas Saraceno also seeks to transcend borders and the concept of a nation state through his visions of alternative, often floating, utopias. 3 x 12 MW (2007/9) is part of his ‘airport city’ concept, a conjoined network of cells that use solar energy to float. With no border restrictions Saraceno imagines a world where synergy is encouraged between people and nations. The giant floating bubbles, crossed with ropes and weighed down with other bubbles filled with water, hover deliciously against the massive concrete pillars running through the gallery space. Ideas about reclaiming land and taking on big business are nowhere better demonstrated than in Agnes Denes utterly breathtaking Wheatfield – A Confrontation (1982). The Hungarian artist planted and harvested two acres of wheat in New York, on land worth $4.5 bn, in the shadow of the city’s imposing financial district. Shown here are amazing photographs of the golden wheat juxtaposed against the statue of liberty and skyscrapers, including the twin towers. There are also beautiful conical ink drawings showing a fir forest planted by the artist in Finland – Tree Mountain (1992-96), but it is the astonishing image of Denes standing in the middle of her wheat field, staff in hand, the iconic New York skyline as her backdrop, which burns into the retina long after leaving the exhibition. The piece was recreated for this exhibition on wasteland in Dalston, east London. Operating in New York at the same time as Denes was Mierle Laderman Ukeles. Her manifesto to celebrate and explore everyday processes led her to shake hands with every one of the city’s ‘sanmen’ and thank them personally for their work dealing with the city’s sewage, in her famous piece Touch Sanitation (1970-80). Exhibited here is her letter to the workers. ‘Thank you for keeping New York city alive!’ she writes, and invites the public to join her in thanking the workers by waving whenever they see them. The ideas of Denes and Laderman Ukeles are brought up to date with the work of Lara Almarcegui and Luke Fowler. Spanish Almarcegui offers a slideshow and pamphlet detailing the wastelands of the Lea Valley, currently being redeveloped for the 2012 Olympics, while Glaswegian Fowler exhibits Bogman Palmjaguar (2007) a 30 minute film of interviews with a man diagnosed as a paranoid schizophrenic who passionately campaigns on behalf of the now drying out Flow country peat bog in the far north of Scotland. The legacy of this exhibition is the work of Newton Harrison and Helen Mayer Harrison – a recreation of their 1972 piece Full Farm. As part of their commitment to only make work that benefits ecosystems, Full Farm is an installation of the crops needed to maintain a balanced diet. In raised wooden beds, tomatoes, beans, raspberries, courgettes, celeriac, beetroots and chard grow in orderly rows, whilst outside on the balcony a wild meadow has been planted for animals to feed on. In order to show the work, the Barbican had to agree to donate the garden to a local school after the exhibition closes. The piece is just one of the deeply moving, often joyful moments that radiate throughout the gallery.